The law aims to protect animals from neglect and cruelty, and to protect the community from animals becoming a nuisance or danger. If you don't comply with legal requirements, such as microchipping, registration, and confinement of dogs to the property, you can be fined. Under animal cruelty legistlation, if you mistreat or fail to properly care for your dog you can be prosecuted and face fines, jail or a ban on owning an animal. All dogs three months of age and over must be registered with Council. Existing registrations must be renewed by 10 April each year. Dogs being registered for the first time must be microchipped prior to registration. Permits are required when there are more than a certain number of dogs kept in a household or property. Legally, you are required to securely confine your dog to the property. This means your yard must have a closed gate, and an escape proof fence that your dog cannot jump, get under or through. Visitors must also have safe access to your front door, without being stopped by your dog. If your dog could get through your gates or fencing, you can be fined even if he/she doesn't actually leave your property. Confinement without exercise and socialisation, however, can lead to boredom, health issues or nuisance behaviour. A dog of any size or breed can become aggressive when defending its territory. Even a friendly dog may guard the area on or around his/her property, especially when you are not present. Most dog attacks in public places occur on the footpath or road bordering the attacking dog's property. For this reason, it is important to make sure your dog is securely contained. If your dog rushes at or chases someone, you may be fined, and your dog declared as a "Menacing Dog". If your dog attacks a person or animal, penalties can include court action, fines, damages and the declaration of your dog as "Dangerous" or he/she may even be put down. It is important to know how to approach dogs safely, and what to do if you are approached by an aggressive dog. In particular, children need to be taught how to behave around dogs, and parents need to be aware of the importance of active supervision. Children, particularly those aged 0-4 years old, are most at risk of serious dog bite injuries. Research shows that 80% of hospitalised dog attack victims are bitten in private homes by their own dog, or that of a friend or neighbour. Barking is a natural behaviour for dogs; it is one way they communicate. Excessive barking is often a sign that something is 'wrong'. The first step in solving the problem is to determine why your dog is barking (eg: boredom, loneliness, to seek attention, to alert you of something, or due to fear/medical/physical reasons). Depending on why your dog is barking, you may need to take him/her on more frequent walks, alter the backyard environment or make it more interesting (eg provide activity toys, bones to chew), take your dog to obedience classes/training, or take him/her to the vet for a check up. Around 900,000 dogs in Victoria produce 90 tonnes of dog poo each day! Most councils require dog owners to remove and dispose of their dog's poo when in public places. Some councils also require owners to carry an appropriate receptacle (eg bag or scoop) to remove dog poo whenever they are walking thier dog in public. Dogs used for guarding of non residential premises (ie guard dogs). Dogs declared "Dangerous" due to a serious attack on a person or animal. Dogs declared "Menacing" due to rushing/chasing a person. Dogs that have been trained to attack. Dogs that are a "Restricted Breed" (these include Pit Bull Terriers and the Perro de Presa Canario). 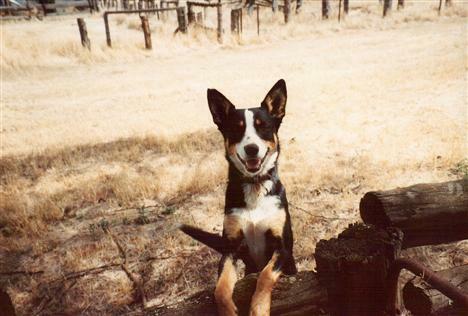 Working dogs are an intergral part of country life. Topics such as dogs on moving vehicles, tethering issues, bushfires, stock attacks, and health issues to working dogs can be found in the DPI website. Restricted Breeds Certain dog breeds are classified as dangerous and the importation of these breeds is restricted. Barking Dogs How Council handles barking dog complaints and advice on how to control your barking dog. Dogs Wandering at Large It is important that all dog owners ensure that their dog is securely confined to their property.